Reach your daily hydration goals by tracking what you drink with this snappy water bottle. Reach your daily hydration goals by tracking how much you drink with this snappy water bottle. An intuitive system of one to four dots tallies the number of bottles you've downed without complicated calculations or hydration tracking apps. 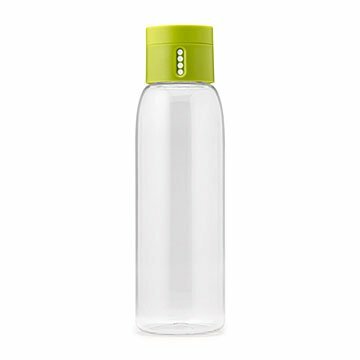 A new dot appears on the leak-proof cap every time the bottle is filled and closed, showing your intake of water up to 80 fluid ounces. Made of tough Tritan plastic, it's a smart, healthy accessory for home, office, or gym. Designed by Richard and Anthony Joseph; made in China. Only the green lidded water bottle is available at this time. Twin brothers Richard and Antony Joseph enjoyed a creative childhood: "our mother is an architect, and our father had a glass manufacturing business in the UK, so there was a strong creative influence when growing up." Their contemporary kitchenware company's team spends a good amount of its time in the office kitchen testing complete sets of utensils and appliances to generate fresh, problem-solving ideas and products that meet the company's high standards in four core areas: functionality, innovation, longevity, and aesthetics. Hand wash the lid. The bottle is dishwasher safe. Wonderful product. Helps me to remember to drink enough water for better health. My daughter brings this bottle to school. It is light and easily fits in her school or sports backpack. Not super fancy or expensive but does the job of keeping track of how many bottles she's had during the day so she doesn't fall short. I purchased this for myself, a college student who needs to drink more water. So far, I only drink about two dots a day and this is already helping me improve. I was worried it would need batteries, but the top system is a perfect mechanism, and it is easy to drink out of. Highly recommend. I bought this for my brother who has special needs and needs to track water intake. I like how simply it tracks the water but the opening is awkward to drink out of. Buying a second for my husband! Great for tracking and encouraging water consumption. Will be buying again. Made it on to my desk at work. Pretty basic bottle but good reminder to drink more water so I guess it serves the purpose intended. This WORKS. No leaking and it looks beautiful. This was one of the best gifts for an active sibling! She uses it to make sure she's getting enough hydration for her daily activities. super acccurate! Before you start a diet or just to be healthier, understand what your water intake should be versus what it is!